As I mentioned yesterday, I have been doing my best at using what I have on hand for meals this week. Often times that means looking in the fridge to see what I NEED to use before it goes bad. That's basically where this recipe came from. I had a green pepper, one onion, and two potatoes that were going to lose (and I HATE waste) if I didn't use them up. "What can I do with these?" I thought. Then it hit me! Why not just cut them up, and roast them! Ahhhh yes, delicious! It was so simple and I can't wait to share it with you! To begin you will want to line a baking sheet with some aluminum foil. Then place into oven and preheat to 400. 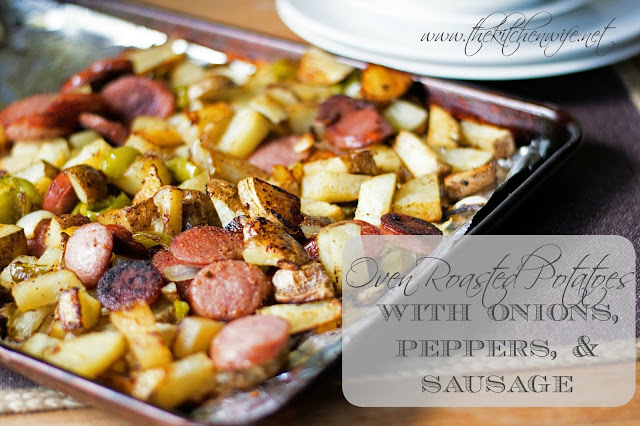 While the oven and baking sheet are heating up you can chop the vegetables and sausage. Once the oven is preheated remove the pan from the oven and spray with cooking spray. Place all of the cooked vegetables on the sheet. You should hear a nice sizzle. This is what is going to give your potatoes and onions that lovely crispiness. Drizzle the olive oil over everything. Then give everything a toss with your spatula and make sure it is in one even layer on the pan. Place in a 400 degree oven for 30 min. At the 15 minute point take out of the oven and give everything a little toss. Place back into the oven for another 15 minutes. And there you have it! A gorgeous meal, ready in minutes, with little to no clean up! OH YEAH! And can we talk about flavor? It's out-of-this-world. You can serve it on a bun, over rice, noodles, or do like I did...just eat it straight out of the bowl! No matter how you eat it, you're going to love it so get in the kitchen and make it TONIGHT! And if you have any easy go-to meals I would love to hear about them! To begin, line a baking sheet with aluminum foil. Place the baking sheet in the oven and preheat to 400 degrees. While oven is preheating, chop all of the vegetables and sausage. Once oven and baking sheet have preheated, remove from oven and spray with a little cooking spray. 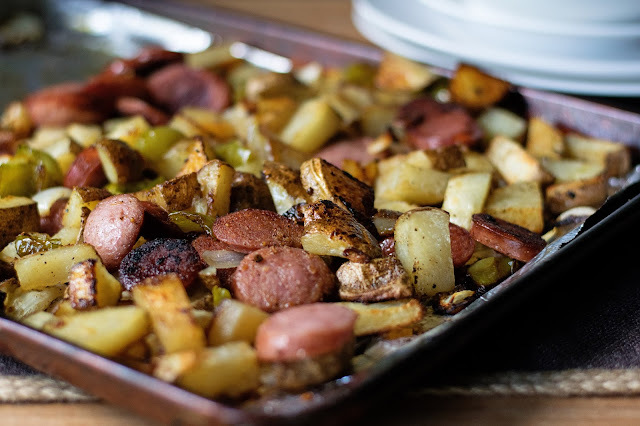 Place all of the vegetables and sausage on the cooking sheet and drizzle the olive oil over everything. Season with the salt, pepper, and seasoning salt. Toss with a spatula and make sure everything is in one even layer on the pan. At the 15 min point remove from the oven and give everything a little toss. Return to the oven for 15 more minutes and you are done!